Teck Resources Limited (NYSE:TECK), CNX Coal Resources LP (NYSE:CCR), and SunCoke Partners LP (NYSE:SXCP) spent most of last month on the upswing. And the advances were material, ranging from nearly 15% for SunCoke to just under 20% for Teck. 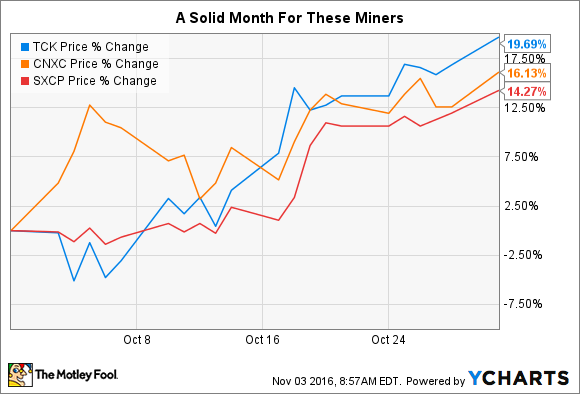 In other words, it was a pretty good month for investors in this trio of coal miners. In its late-October earnings release, Teck summed up the met coal market well when it explained, "Our steelmaking coal price realized in the third quarter (US$92 per tonne) reflects the quarterly benchmark price that was settled in late June as well as spot price sales in the third quarter. Since then, steelmaking coal prices on the spot market have risen sharply, exceeding US$200 per tonne from mid-September." There are two takeaways here. First, met coal has seen a huge price spike. Second, Teck's contract price means it's making less than half of what it could if it were selling all of its coal on the spot market. On one hand that's a drag, but on the other it means that as contracts roll off and contract prices adjust to market conditions, Teck, and its met-exposed peers SunCoke and CNX Coal Resources, will likely see higher revenue from their met operations. No wonder investors were excited, bidding the stocks higher. Unfortunately, Teck also wanted to temper investor optimism. The company mentioned some of the reasons for the price spike, including a notable supply-demand imbalance in China, and added, "We are encouraged by the improved commodity price environment, but remain cautious about how long the supply/demand imbalance will last." In other words, investors shouldn't get too excited just yet. Note that Teck also mines for copper and zinc, and is expanding into oil. So there's more at play here, but coal has been a notable issue for the company lately and drives around a third of the top line. While CNX Coal Resources noted the improving coal prices, it also benefited from the positive impact of a drop-down from its parent, CONSOL Energy (NYSE:CNX). Although it only increased its ownership stake in the Pennsylvania mining complex involved by 5%, the partnership expects the transaction to increase adjusted EBITDA by a far more notable 25%. CNX also sells thermal coal, which was another positive, but the bigger impact on the partnership's price was likely from met coal and the acquisition. SunCoke Energy Partners, meanwhile, announced on the last day of October that its parent, SunCoke Energy, Inc. (NYSE:SCX), was looking to buy it out. So the stock has been helped by met coal prices, along with other operational successes, but the big story going forward will be the deal with SunCoke Energy, Inc. It's a key issue for investors to keep in mind that will likely leave the shares somewhat range-bound from here. So what should investors do with all of this? It's probably best to heed Teck Resources' advice and not get overly excited by coal prices. In fact, even thermal coal miner Alliance Resource Partners pointed out in its third-quarter conference call that improved pricing and demand on the thermal side of the coal business is nice, but it's still not enough to start opening closed mines. In other words, met coal or thermal coal, the coal market is still a volatile and tough business right now. That said, if you're looking for a coal-focused play, CNX Resources has a bit more going for it, since it can grow its top and bottom lines via drop-downs from its parent. That might be worth a deeper dive for investors looking at the coal space, and transcends the issue of coal prices. SunCoke Partners, meanwhile, is now a special-situation play focused on the pending acquisition -- the coal market is tangential to the story. Is There Any Growth Left for SunCoke Energy, Inc. and SunCoke Energy Partners, L.P.'s Stocks in 2017?